with a white hotel for whites and a gold pagoda for the golden. 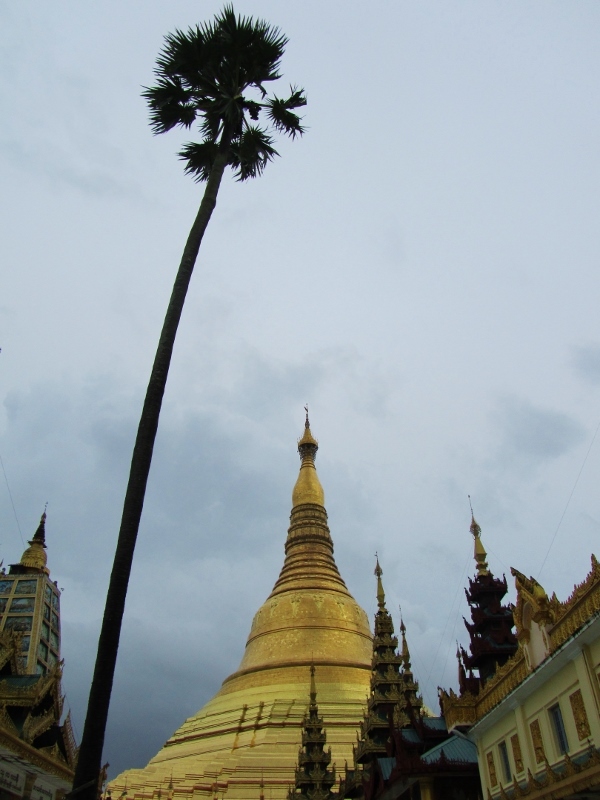 Yangon was where I started and ended my journey in Myanmar. 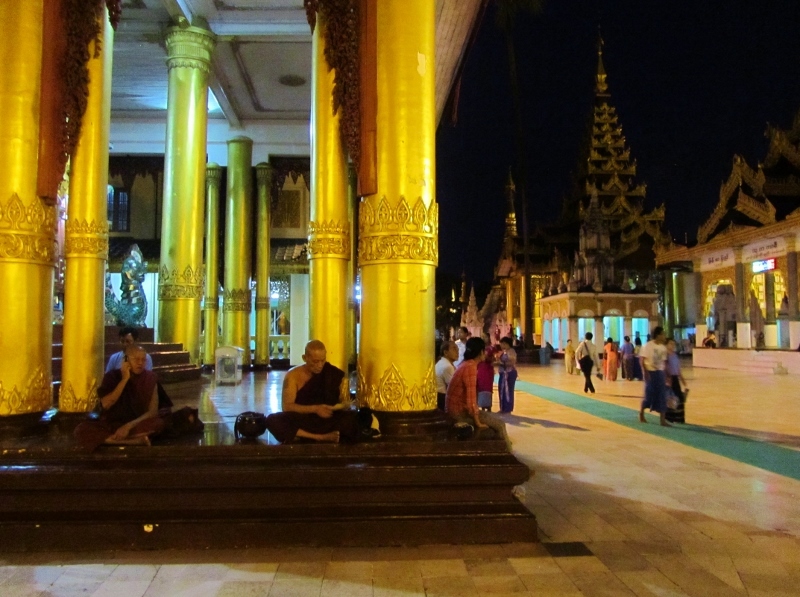 I usually feel a little overwhelmed at first when I’m in an unfamiliar place, and Yangon was definitely overwhelming. 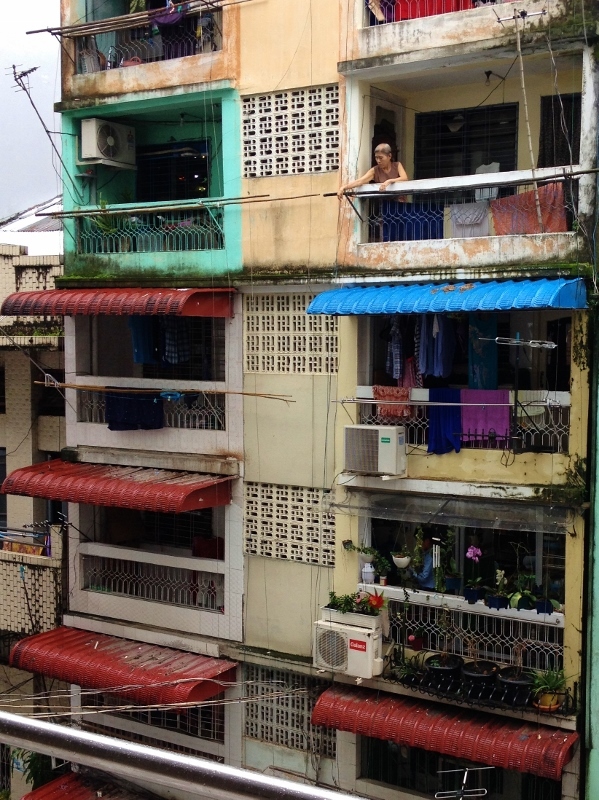 In the taxi from the airport to my hostel, I noticed the dilapidated houses, the local buses with no glass in the windows or doors in the doorways, and people getting soaked in the monsoon rain. In the evening, I wandered around the streets near my hostel. 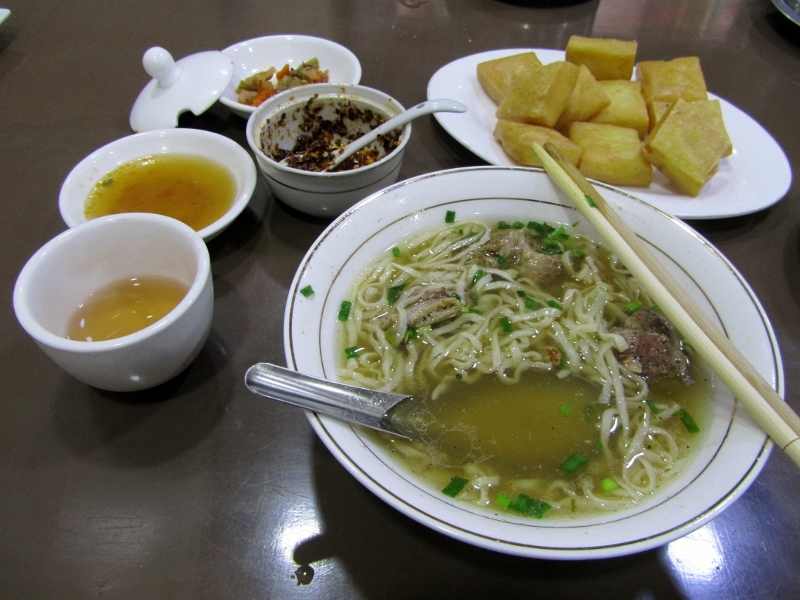 I walked by little street food stalls set up under plastic awnings, serving up food that was a mystery to me. 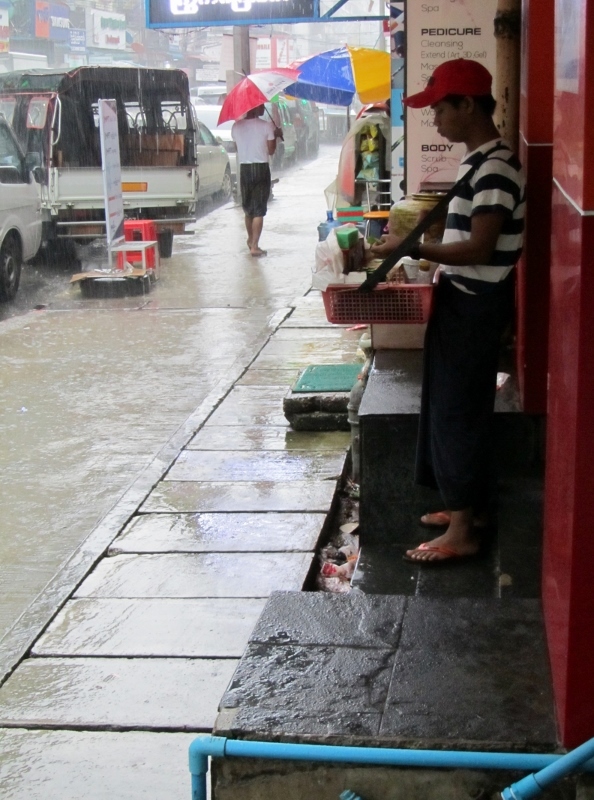 I tried to avoid the puddles and stray dogs that were everywhere. I didn’t have the courage to cross the road because there were no pedestrian crossing points. 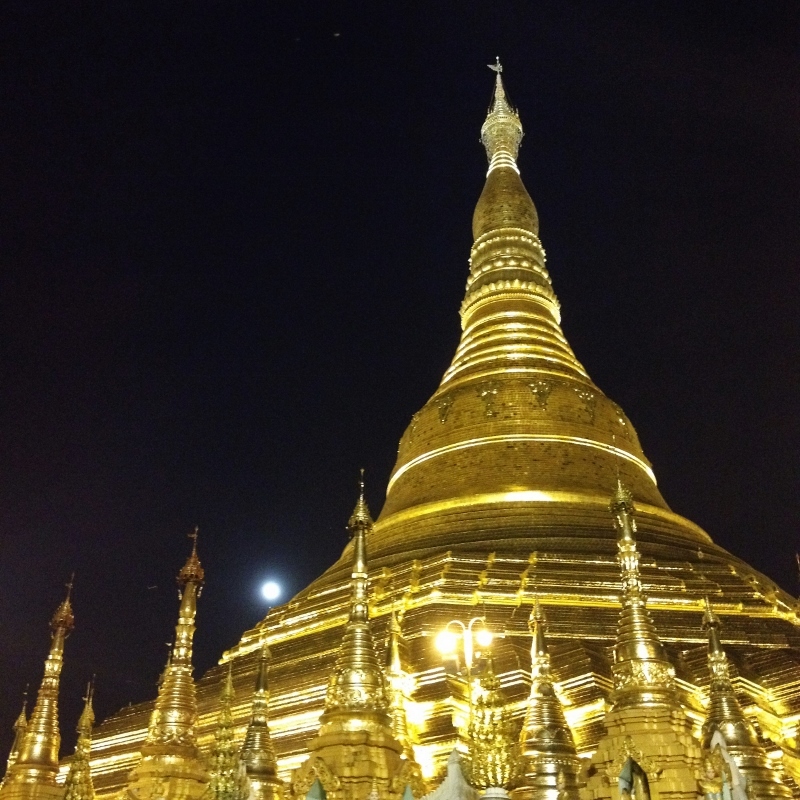 I spent a few days in Yangon before I left Myanmar, and I really enjoyed it because I had gotten more used to Myanmar. 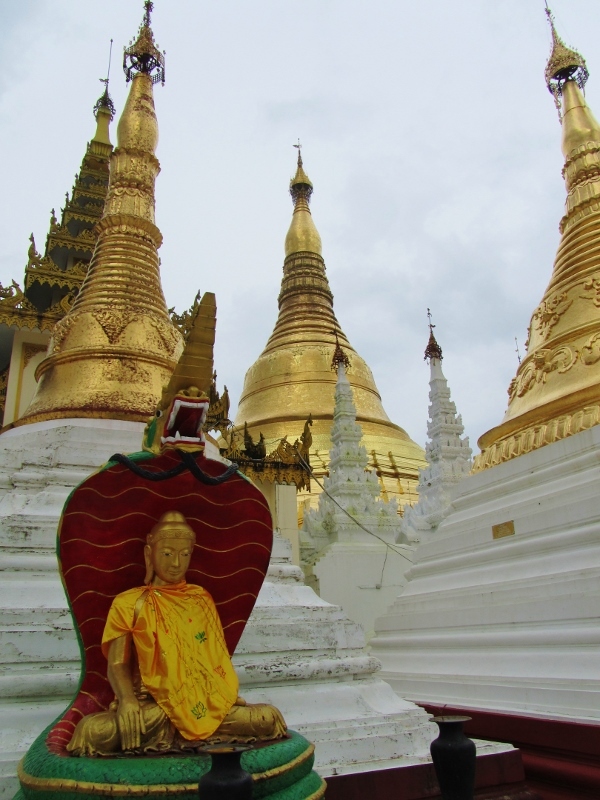 Taxis are cheap (no motorcycles though), but I really liked walking around the streets looking at the shops and the buildings, as well as visiting particular places like the Shwedagon Pagoda and the National Museum. My technique for crossing busy roads was to find someone who looked like they were about to cross and I’d follow their lead. It rained heavily sometimes, but it wasn’t the constant rain of Mandalay or Bagan, so if you waited for a while, it would stop and the sun might come out. 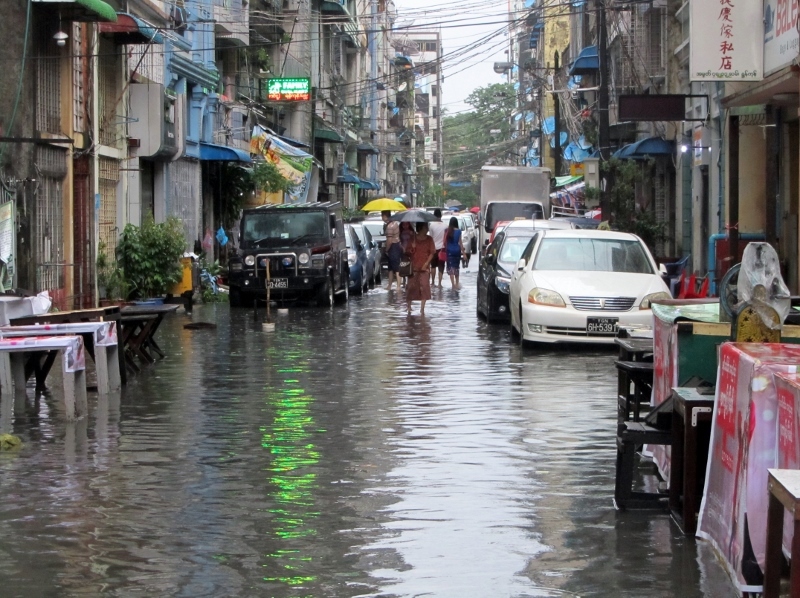 Sometimes the streets flooded and we had to wade calf-deep through the murky water. I had bought a pair a chaco sandals before I went and they were a great investment – I could wear them walking through water (and mud in Bagan) and not have to worry about them coming off my feet. Once, a betel nut seller was sheltering near me from the rain and I could see him making up the little parcels of betel nut, lime and tobacco wrapped in a betel leaf. Just like in other south-east Asian countries, these are chewed by many people for a buzz, leaving their teeth and lips stained blood-red and covering the streets with red splashes when they spit. 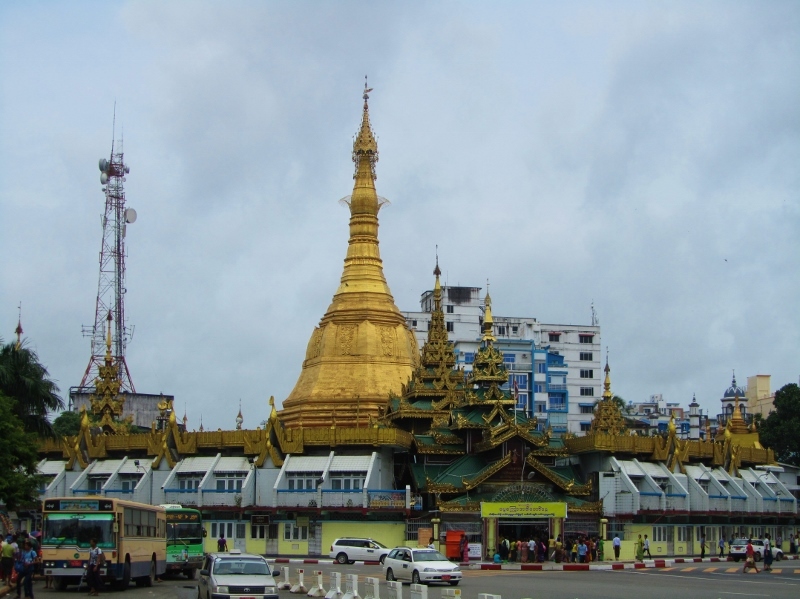 The Sule Pagoda is another famous site in Yangon, and it marks the centre of the city, with most local buses starting or ending there. 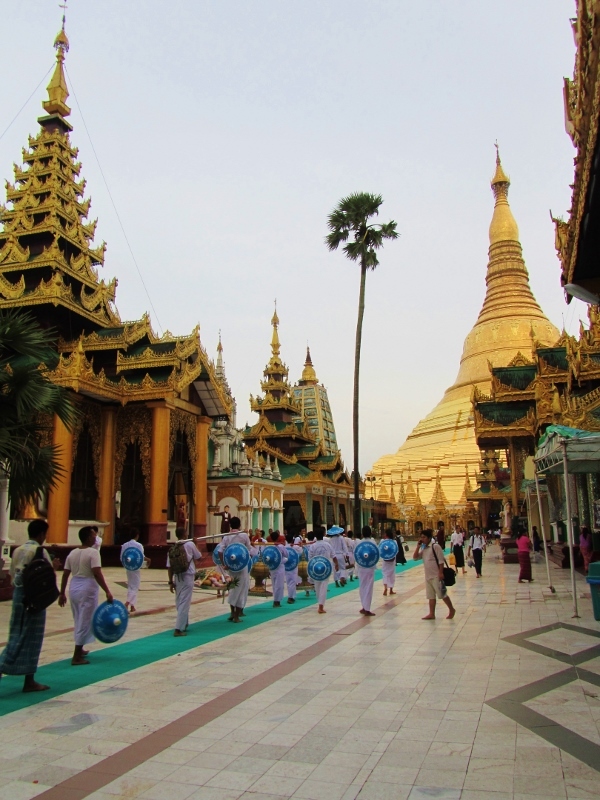 The Lonely Planet recommends a walking tour of the city’s colonial buildings, starting from the Sule Pagoda, and Yangon definitely has a unique representation of its historic buildings. 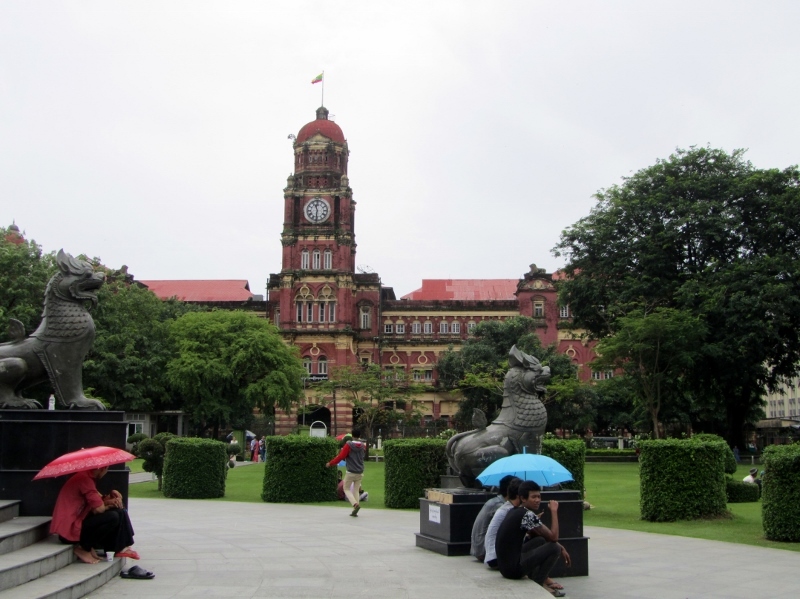 Many other Asian countries’ architectural heritage has been lost due to war or destruction in the name of modernity, preserved as a relic of the past for tourists, or renovated to serve a different purpose. 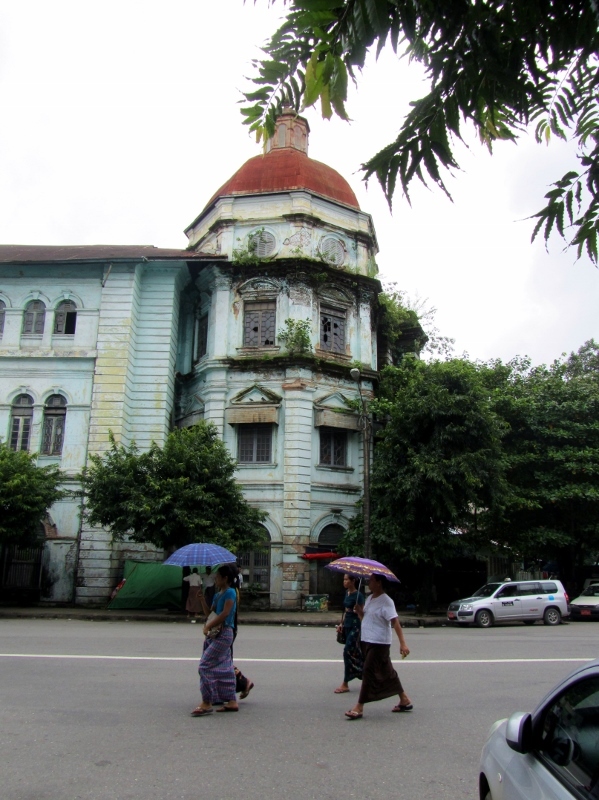 All of that has happened in Yangon too, but the sheer amount of buildings that have been left as they are, to deteriorate with time and weather, is quite unique. 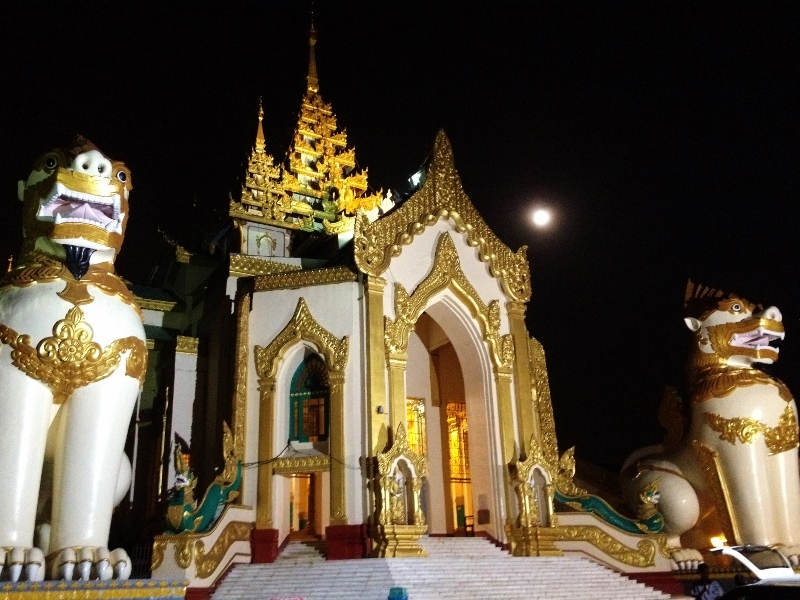 Pagodas and monasteries are the only Burmese structures that survive from pre-colonial times, but due to natural disasters they have been rebuilt, and because their religious significance is more important than their historical material significance, they have been renovated over the years. 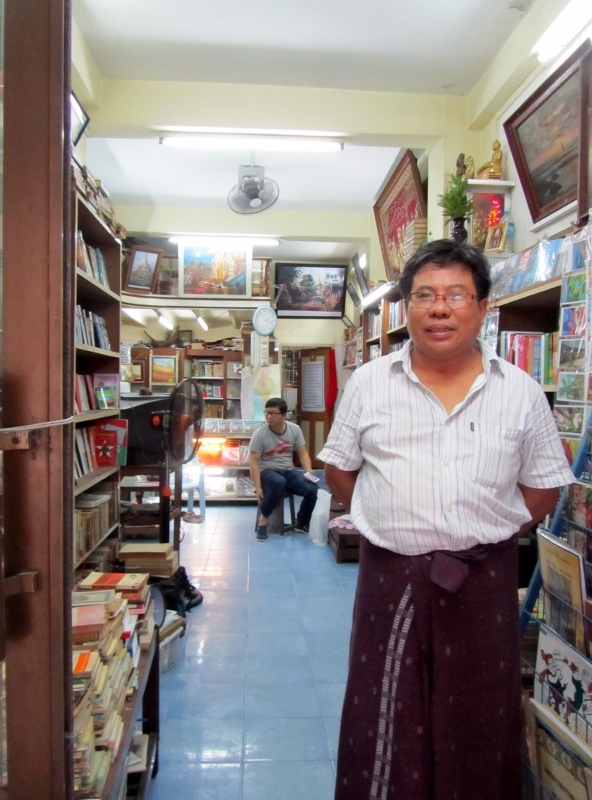 Thanks to the Yangon Heritage Trust, founded by Thant Myint U historian and author of The River of Lost Footsteps: A Personal History of Burma, more attention is being paid to the state of Yangon’s architectural heritage. The building above is the City Hall, that was begun in the 1920s and has kept its original function. It is unique for the tiered roofs on the corner towers and over the main entrance, as well as ornamentation that incorporates traditional Burmese iconography such as peacocks and serpents, that were taken from the architecture of Bagan. In 2011 its light orange exterior was repainted to its present lilac. Aya Bank below was formerly the Rowe & Co. Department Store, known as the “Harrods of the East”, built between 1908-1910. 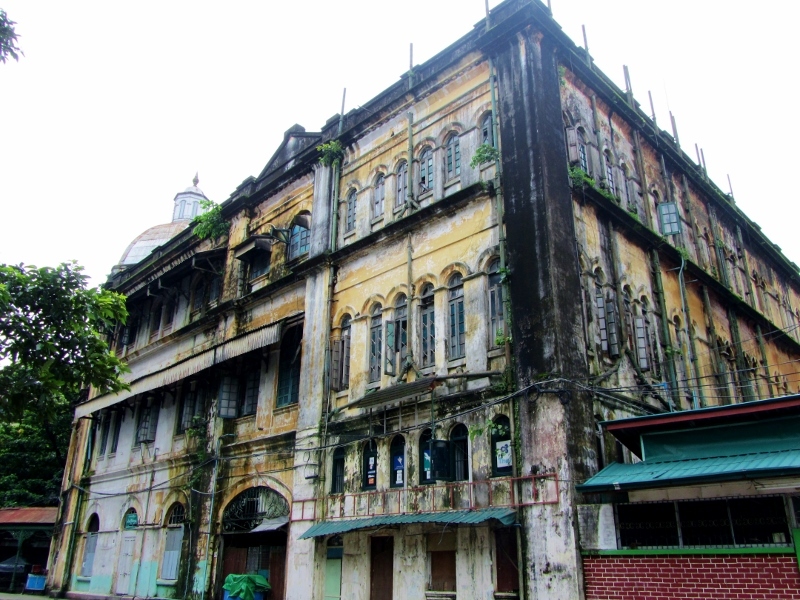 Rowe & Co. had been in Burma since the British take-over in the 1860s and occupied various premises around Yangon until it moved into this specially-constructed building in the beginning of the twentieth century. 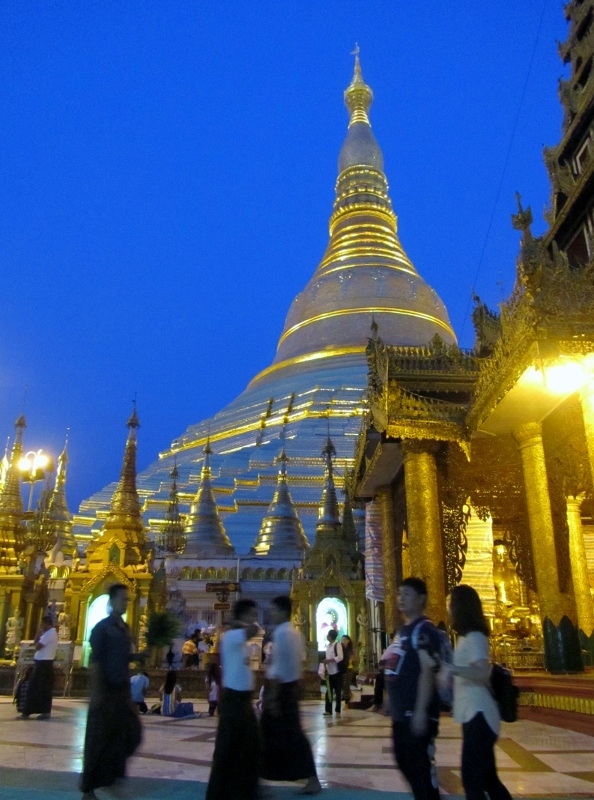 It stayed in business throughout Burmese independence until it was nationalized by the army in the mid 1960s. 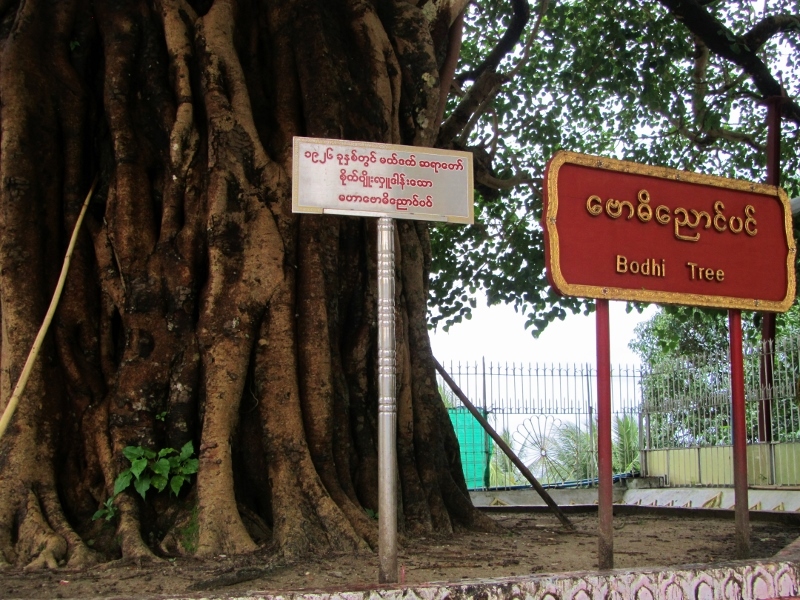 It was used as the Department of Immigration until the government moved to the newly built capital of Naypyidaw in 2005. 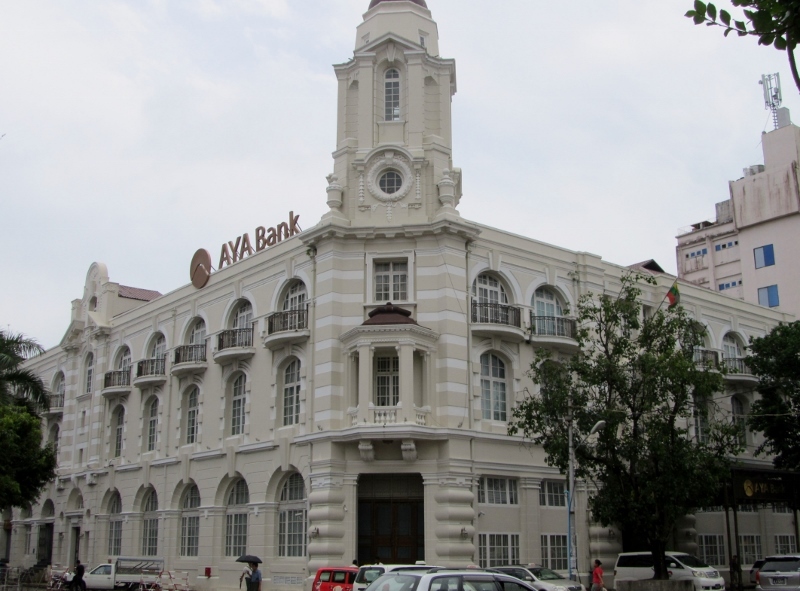 It was badly damaged during Cyclone Nargis in 2008, but was bought and restored by the Ayeyarwady Bank in 2012. 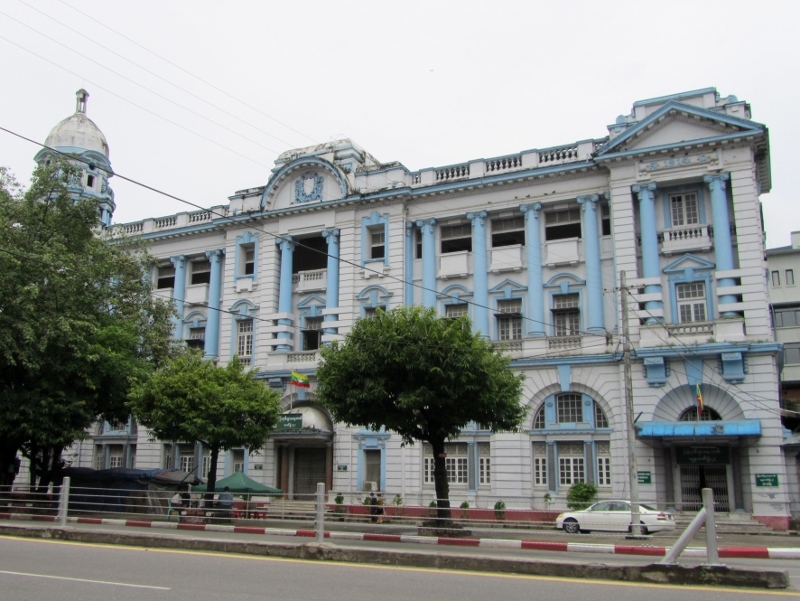 The brick Queen Anne-style building above is the High Court, built from 1905-1911 and is today only partly occupied since the Supreme Court moved to Naypyidaw. 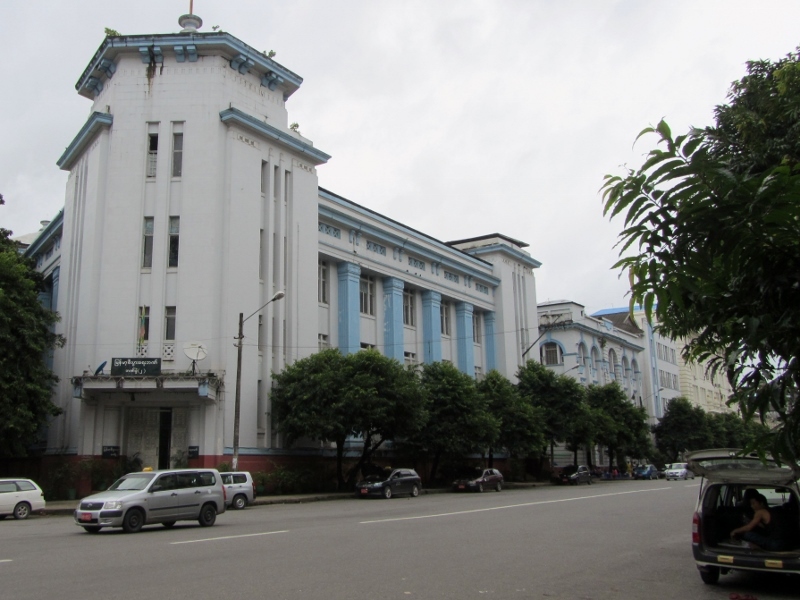 The Central Telegraph Office below was built in 1913-1917 and is still owned by the Ministry of Communications, Posts & Telegraphs. 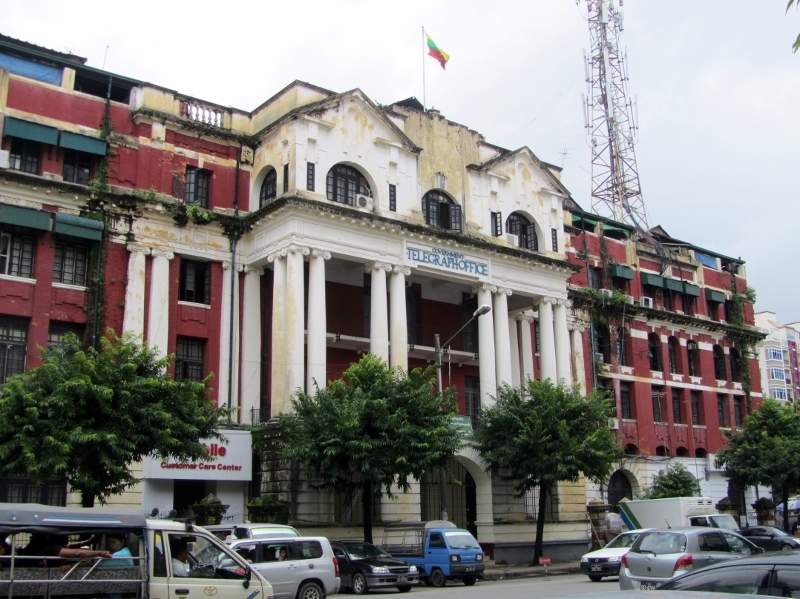 The building above is the former Bank of Bengal, then the Bank of India, until it was nationalized in the mid 1960s and became the People’s Bank 8 and then Myanmar Economic Bank 3, of today. I don’t know if the building below had an important function during colonial times, but it is quite representative of the state of most old buildings that haven’t been restored. 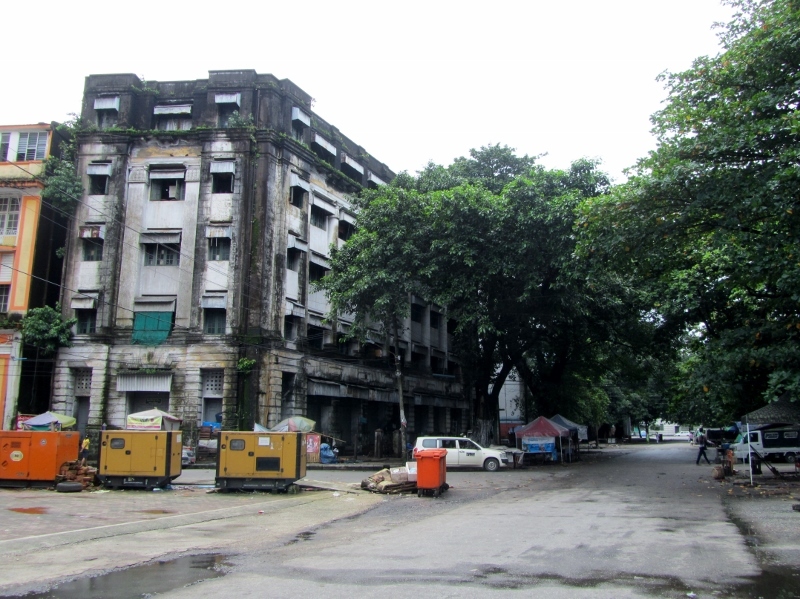 The picture below that shows the back of the Yangon Division Office Complex (formerly the New Law Courts), a massive building whose façade of Ionic columns stretches along the Strand Road, which during the Japanese occupation was used as an interrogation centre and prison by the secret police. 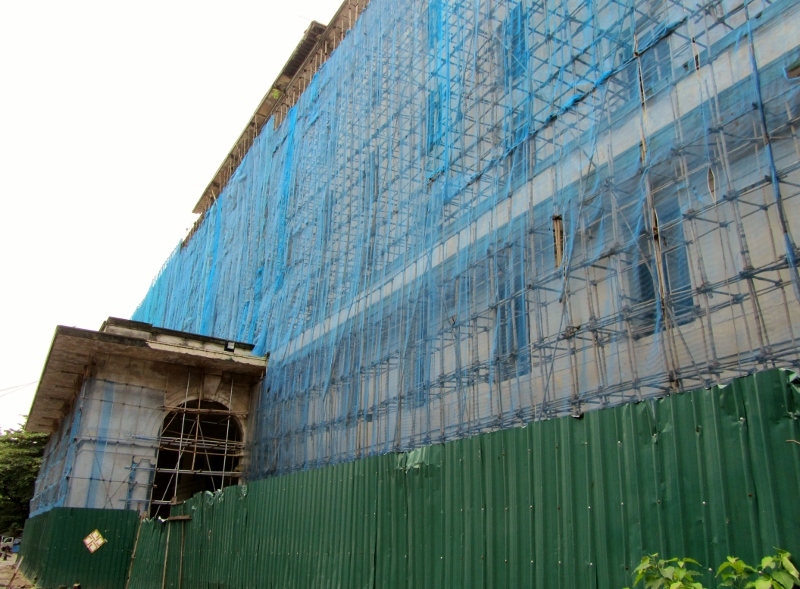 It is now being renovated to become a five-star hotel, despite protests from the Lawyers’ Network. 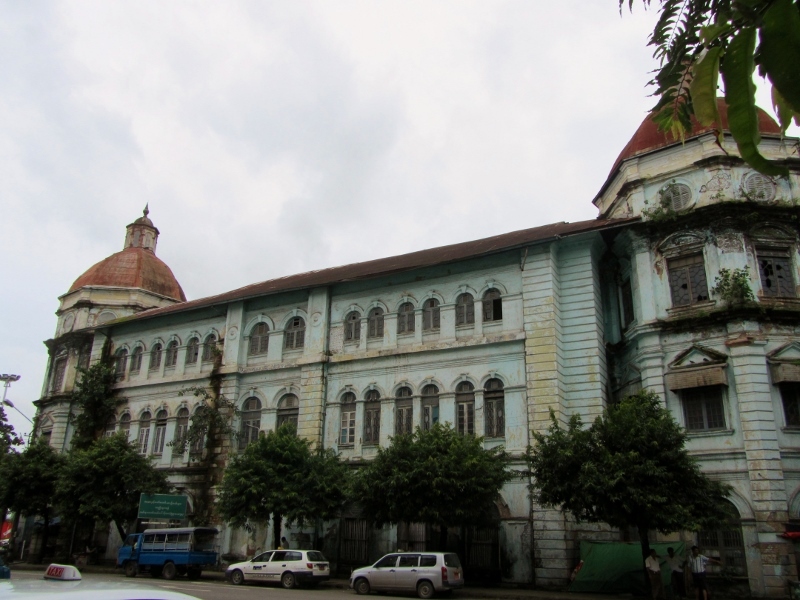 Perhaps the most famous colonial building in Yangon is the Strand Hotel. 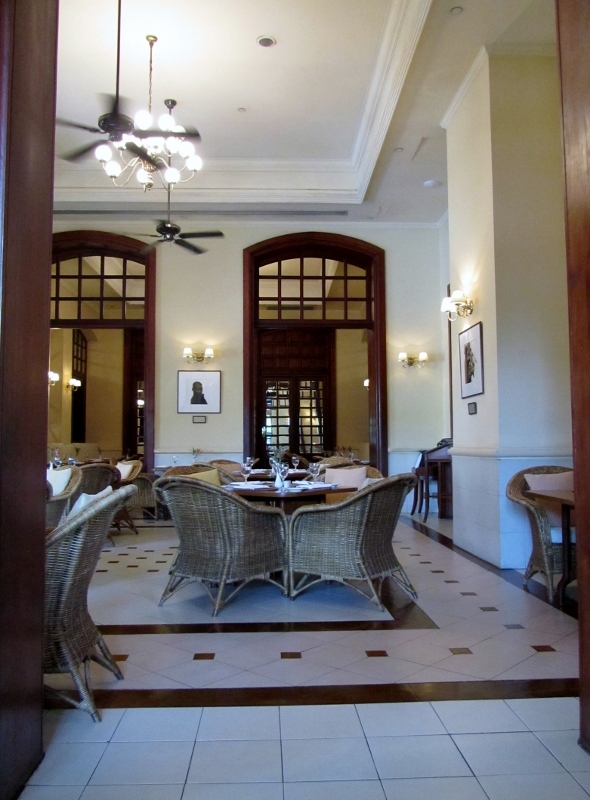 It was built in 1901 by the owner of the Raffles Hotel in Singapore and became the place to stay for the well-to-do. 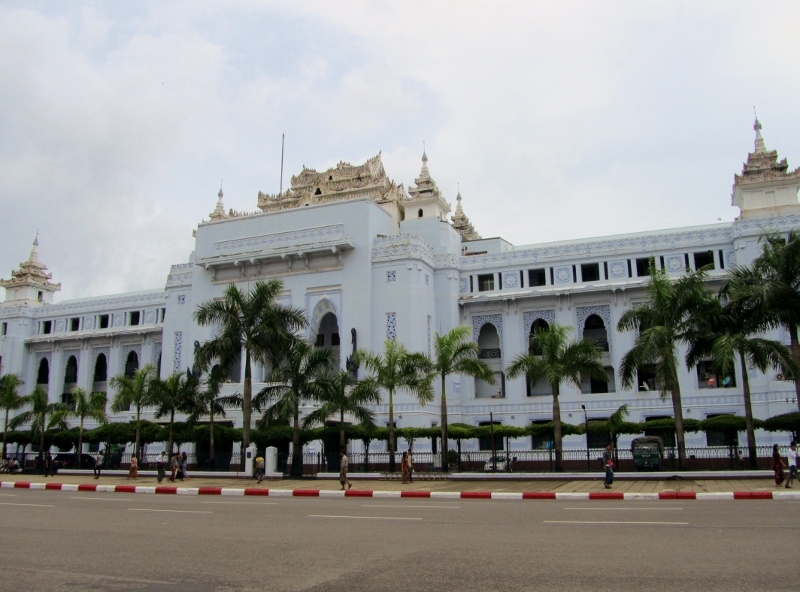 It has an interesting place in literary history because it hosted Rudyard Kipling (who immortalized the name of Mandalay in his poem of the same name, despite never having been there), George Orwell (who wrote his first novel Burmese Days based on his experiences as a police officer in Upper Burma) and Somerset Maugham (who documented his ‘Grand Tour’ of Asia in The Gentleman in the Parlour). Although, I don’t think that Pablo Neruda would have spent much time in the Strand bar while he was consul for Chile, because he was snubbed by the Europeans for acting too much like a local. 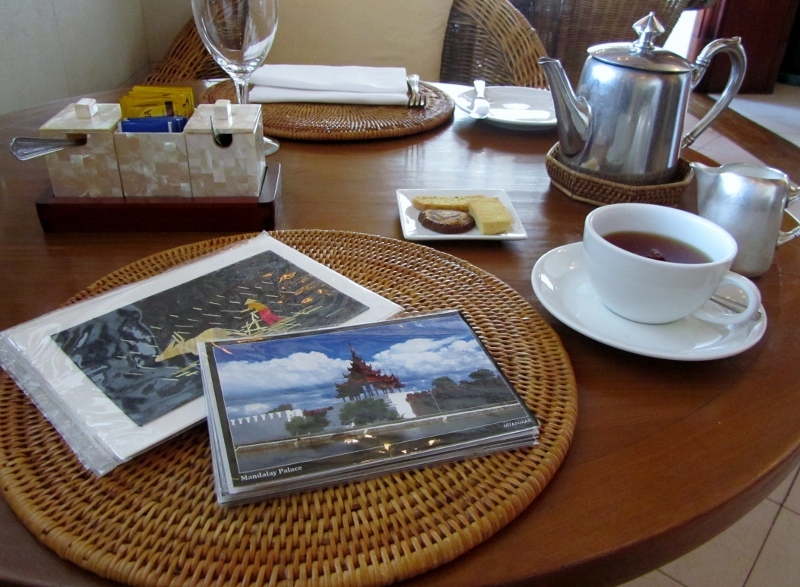 I took a break for tea there and wrote my postcards to send at the Central Post Office next door. The Post Office is a grand building, though with all the rain it seems hard to stop plants from sprouting in cracks in the wall. I didn’t even have to go inside to post my letters because just in the entranceway there was a little desk with two women who had a supply of stamps and glue, so I bought the stamps and then posted them in the slot outside beside the door. 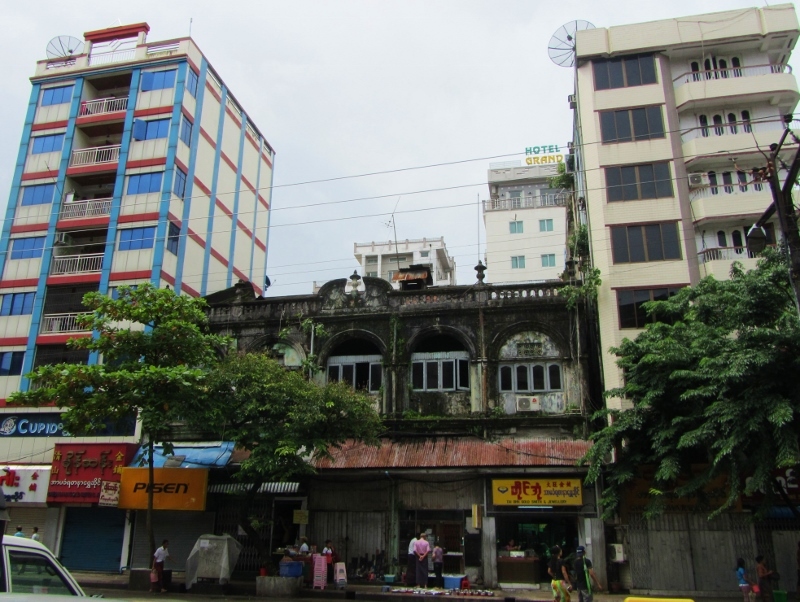 The building above is the Yangon Division Court, formerly the Currency Department, built at the turn of the twentieth century, and beside it (below) is the former Chartered Bank, now the Myanmar Economic Bank 2, from 1939-1941 It was repainted blue and white in 2012. This stretch of Pansodan Street has so many buildings from colonial times when it was the best business address in the city. 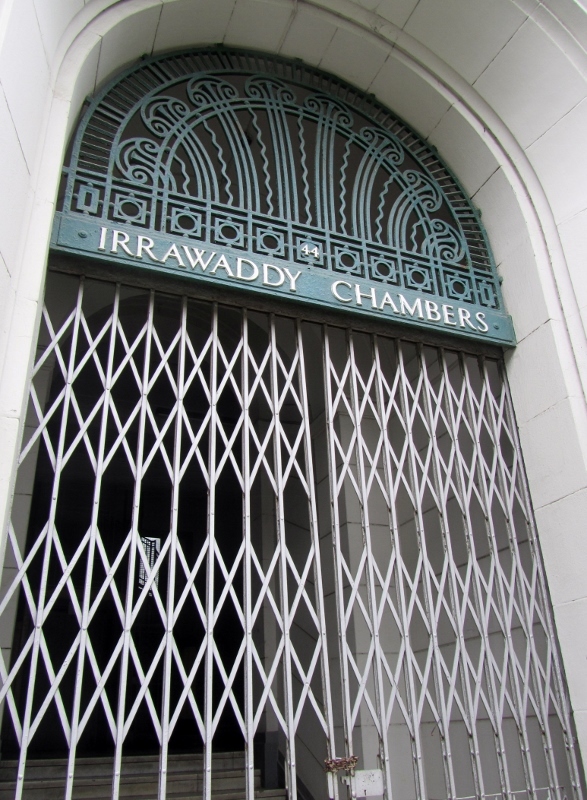 The Irrawaddy Flotilla Company was set up in the 1860s by a Scottish company, and in 1948, after Burmese Independence, it was taken over by the government and it became the Inland Waterways Department. 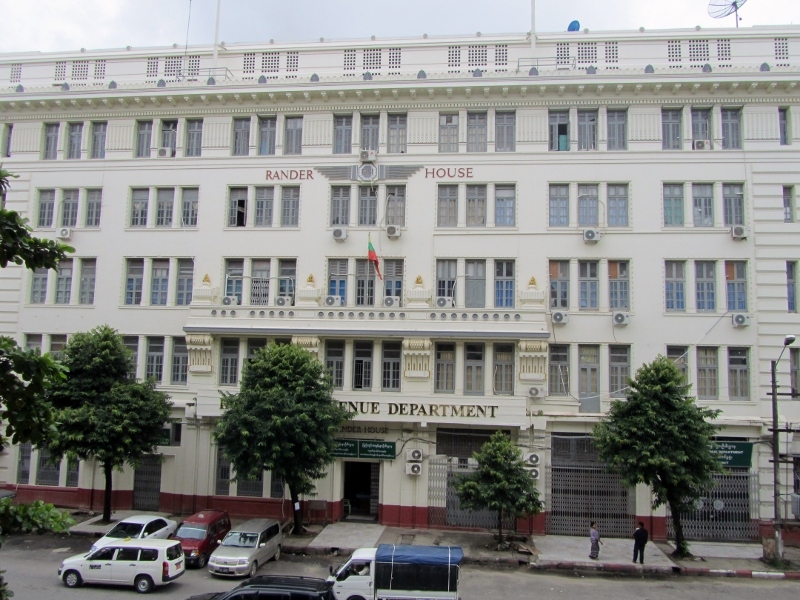 Across the way, stands the Internal Revenue Department, which was formerly Rander House, built in 1932 by Indian traders from Rander in Gujurat. The Loknat Gallery Building was once called Sofaer’s Buildings, after the Baghdadi Jewish brothers who ran a successful luxury food and drink importing business. The brother Isaac Sofaer, designed and constructed the building in 1906, although they only retained the building for ten years until they lost it due to financial difficulties. 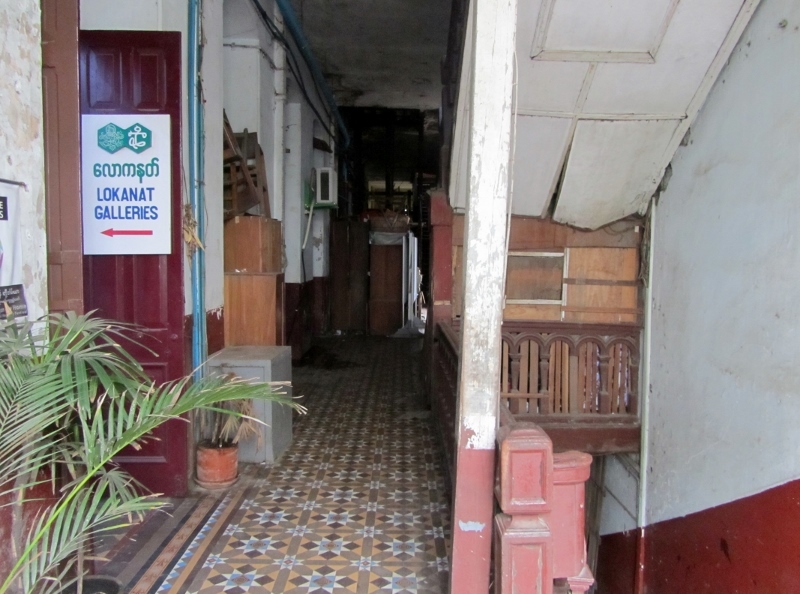 Parts of the building are used by the Internal Revenue Department, just like in Rander House, as well as a variety of other businesses, but the building today is named after the Lokanat Gallery, founded in 1971, that was instrumental in developing Burma’s contemporary art scene. When I went there was an exhibition by Daung Jone and Hlaing Phyo Tun who were in the gallery with their families. The building is in a really bad state and I was afraid that the stairway would crumble away underneath me. Note the beautiful floor tiles that were imported from Manchester. 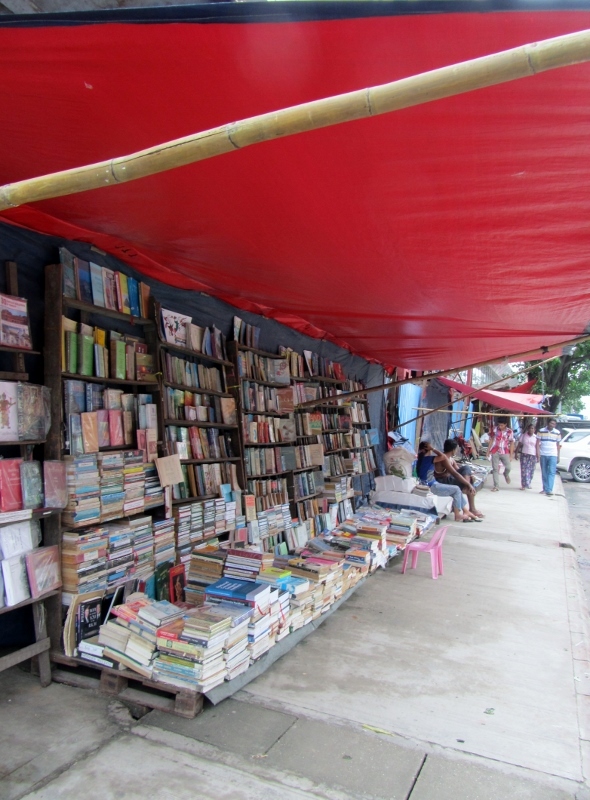 Pansodan Street and parallel 37th Street are home to many book markets and shops. I sheltered from a sudden downpour in Bagan Book House, where I picked up a Burmese English-language magazine from 1958, Cook and Entertain the Burmese Way by Mi Mi Khaing (first published 1975) and 30 Heritage Buildings of Yangon by the Association of Myanmar Architects (where I got most of the information about the buildings in this post). 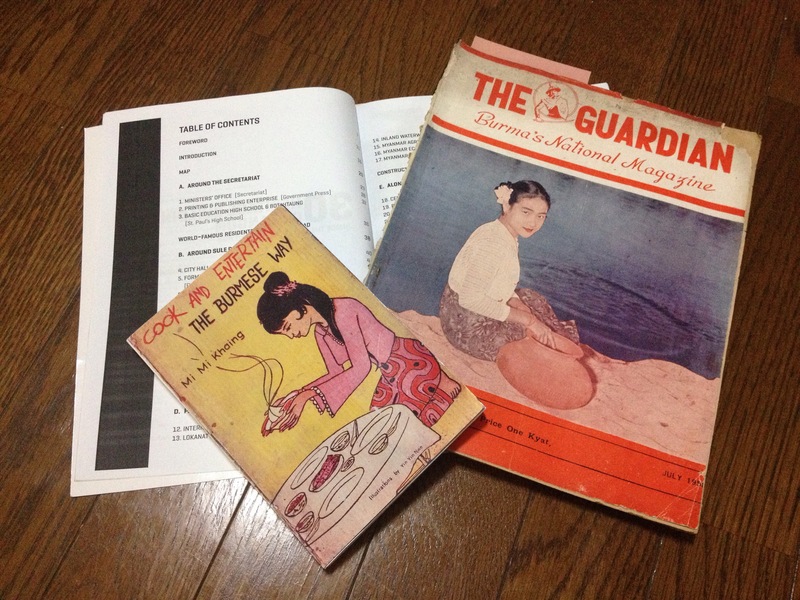 Interestingly, these last two books are photocopies – the pages inside are photocopies of the original that are bound in a colour cover. Later, when I was walking down the street, I heard the whirr of machinery coming from one of the buildings and I saw a small printing press spitting out pages to be bound into books. 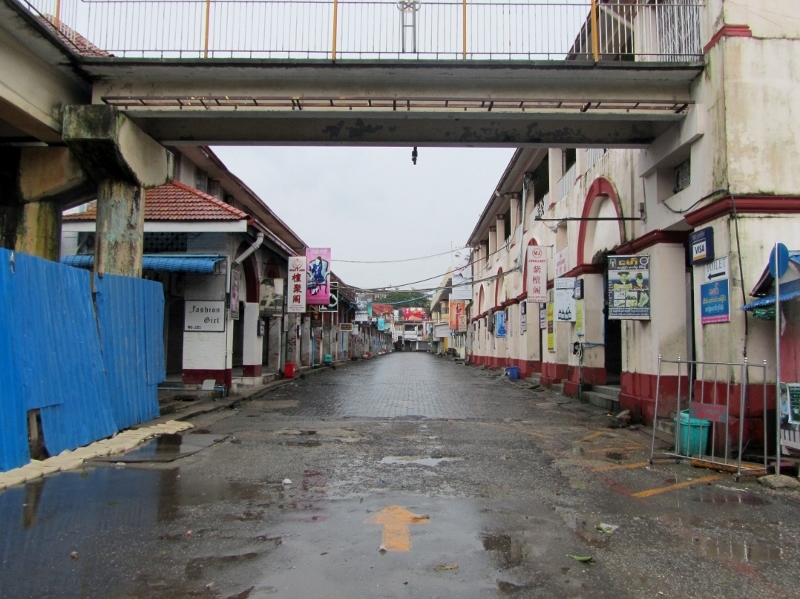 The day I was doing my downtown wanderings was Waso, a Burmese Buddhist holiday, so unfortunately the Bogyoke Aung San Market (built in 1926 and known as Scott Market) was closed. 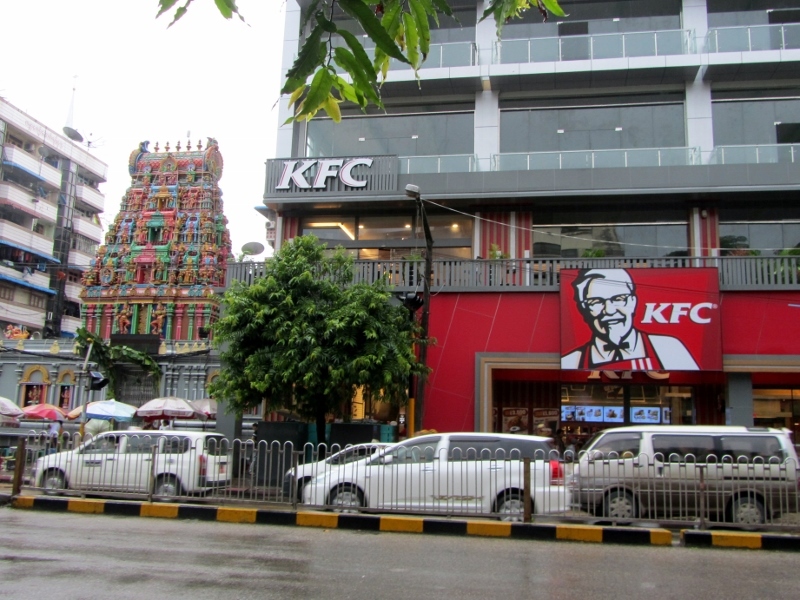 I did however get to see the newly opened KFC across the way, sitting strangely beside a colourful temple. 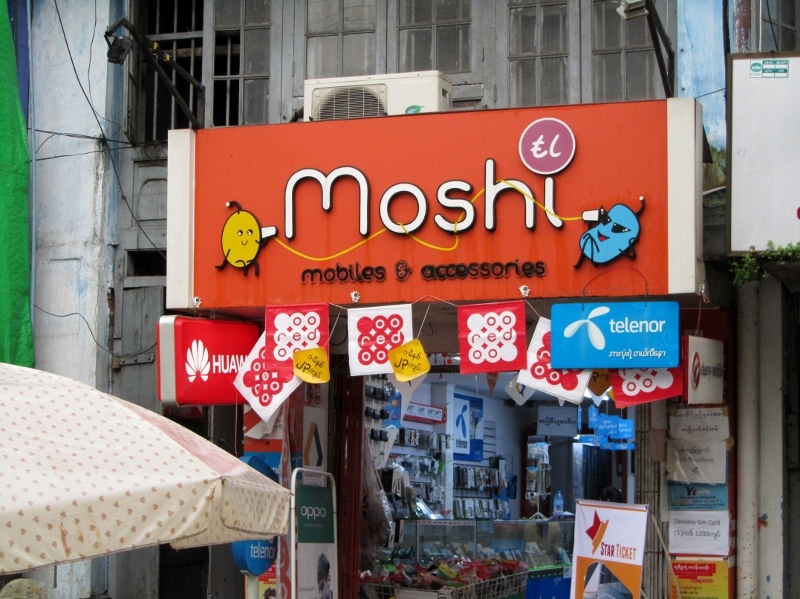 Another sign of the times is the amount of phone shops with their glossy façades and brightly-lit interiors. Until recently mobile phones were out of reach for most people in Myanmar, but during my trip it seemed like everyone had a phone they were attached to. 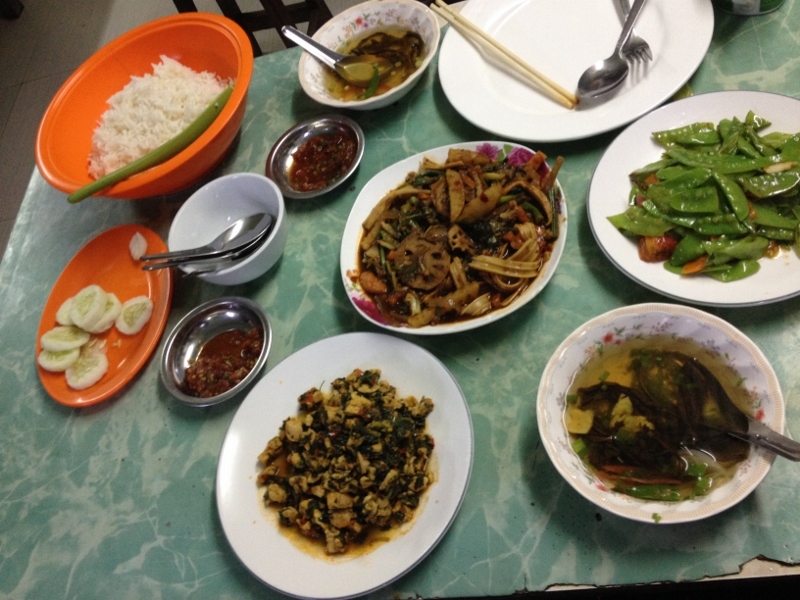 In Bagan I had had such a good time because of the people I was with, so I wanted to try to meet some people in Yangon too. 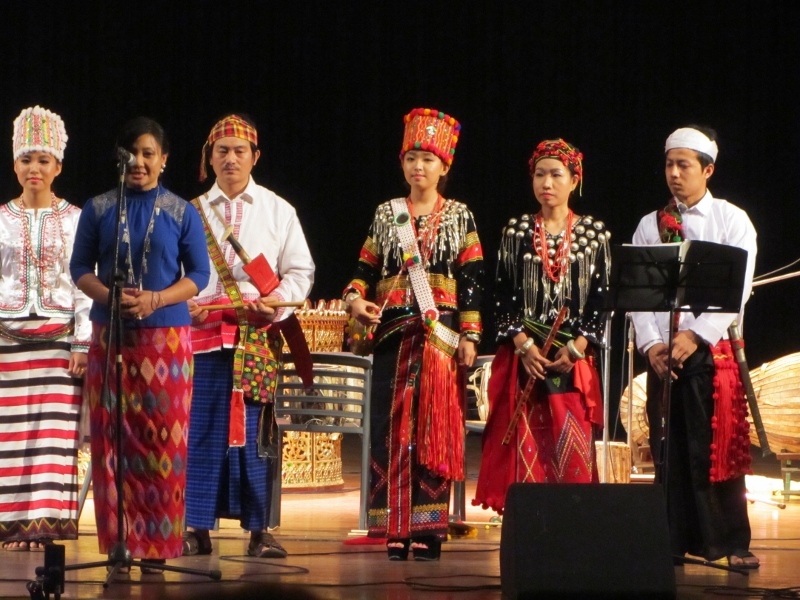 Through Couchsurfing I got in touch with a really nice American girl who was teaching English in Yangon and she went for dinner with me, introduced me to her friends and gave me tickets to a traditional music concert. We even met up in Bangkok later because we were both there for the weekend! It is really great to be able to meet people who live locally because you get to experience so much more. 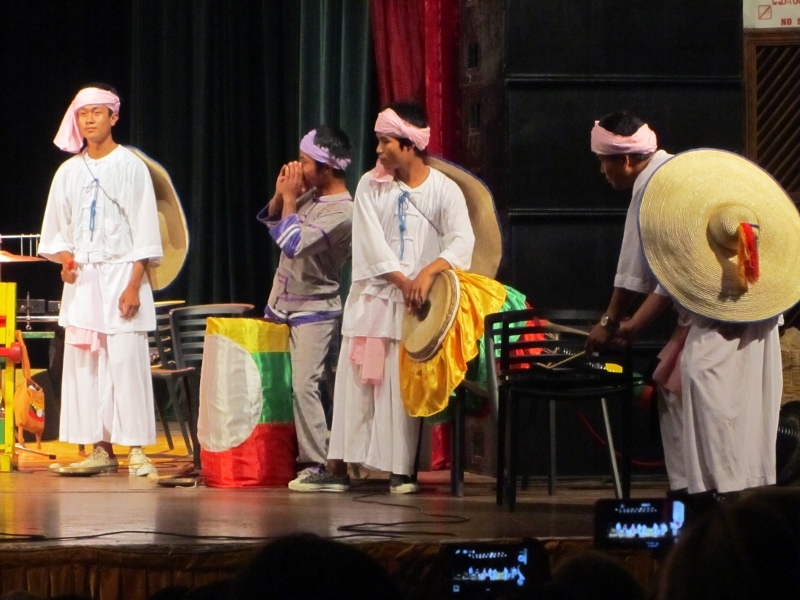 I ate some delicious Shan food (from the area of Myanmar close to the Thai border) and saw a concert entitled ‘Gongs and Skins’ that was the result of a week-long percussion workshop involving musicians from various ethnic groups in Myanmar, France, Germany and others. 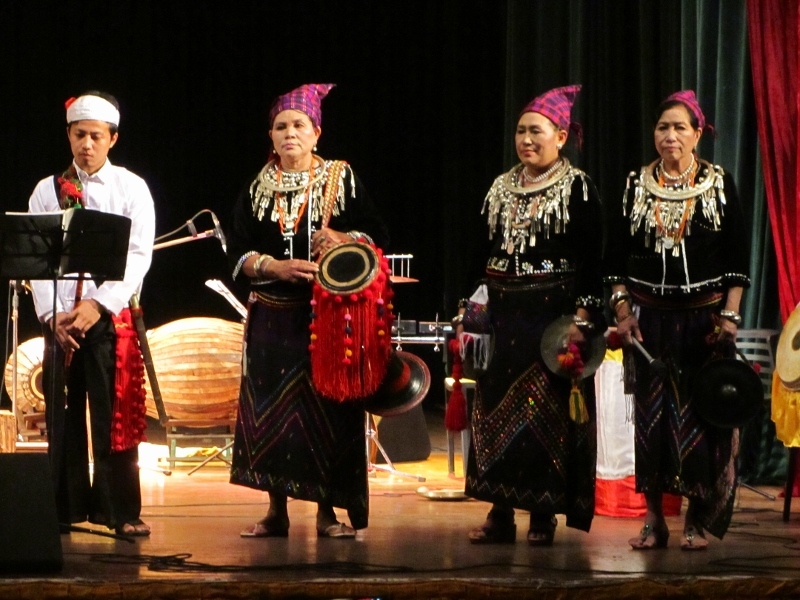 Some groups experimented with the different musical forms and the different ethnic groups, including some Kachins, were decked out in their traditional finery. This is my last post from Myanmar and I hope I could do it justice. 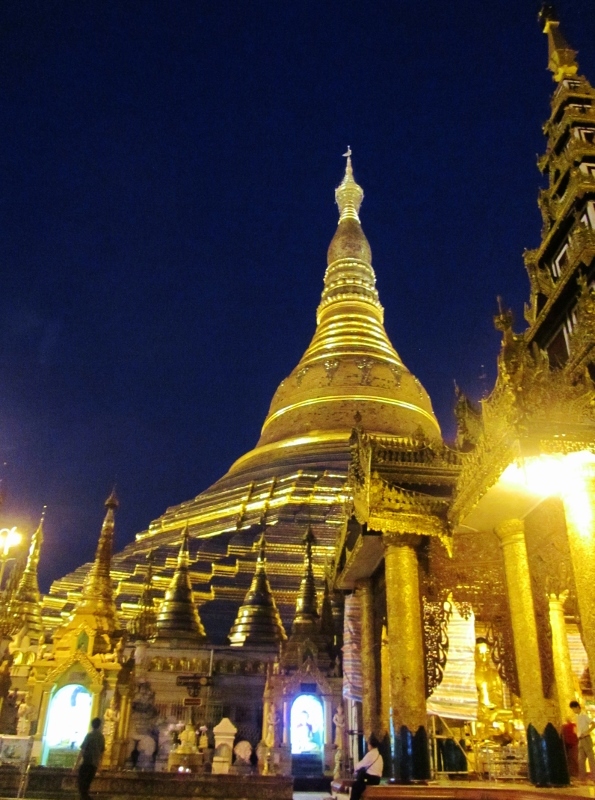 Yangon, former capital and formerly known as Rangoon, is the largest city in Myanmar. 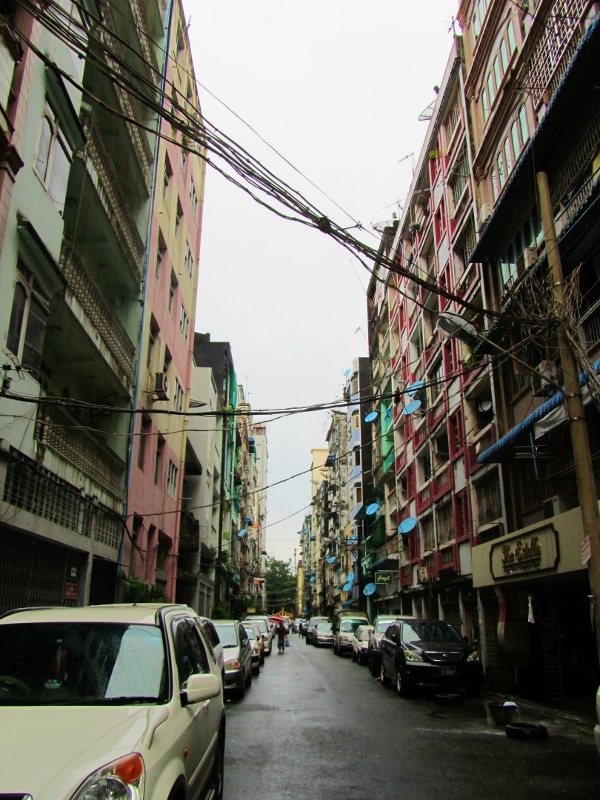 It’s an interesting mix of crumbling colonial buildings, vibrant street markets and colourful places of worship. 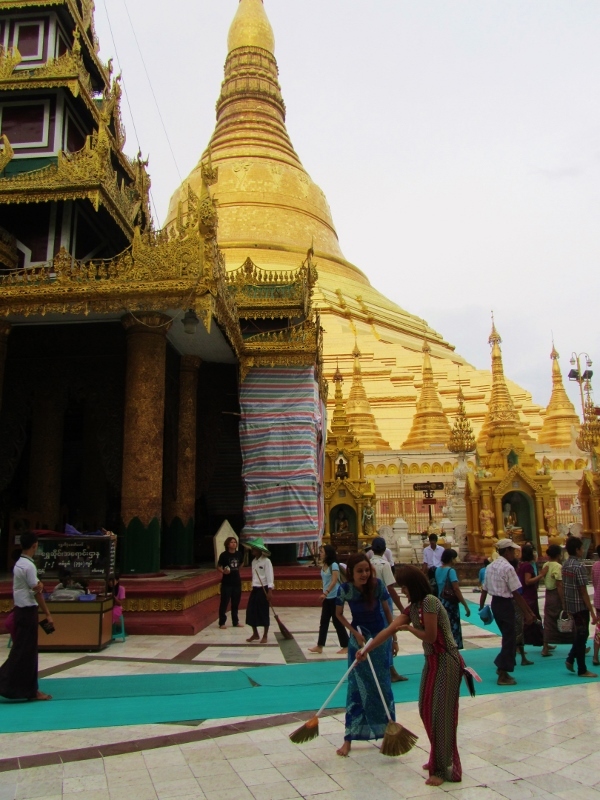 I’ll do another post on the city, but one spot deserves a post of its own – the Shwedagon Pagoda. It’s a massive, ancient, important, magnificent complex. 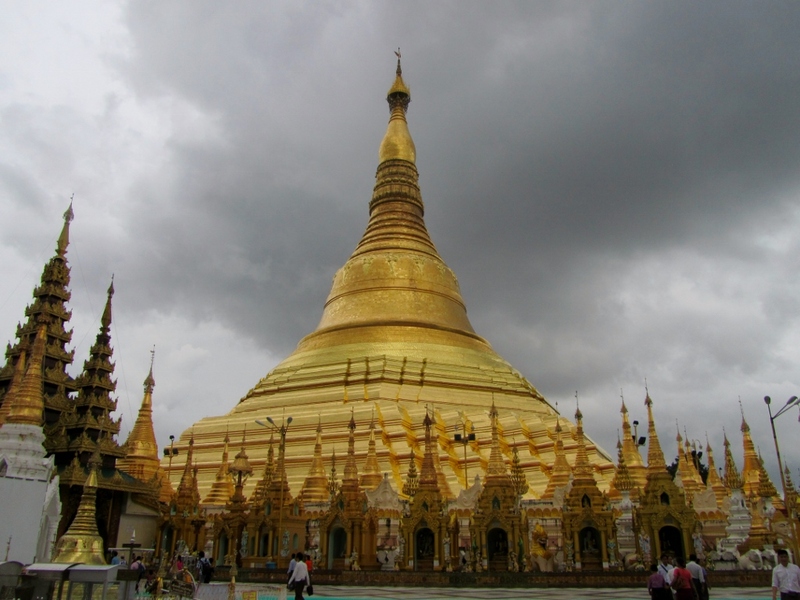 The original stupa is supposed to built over eight hairs from Buddha’s head that he gave to two Burmese merchants. 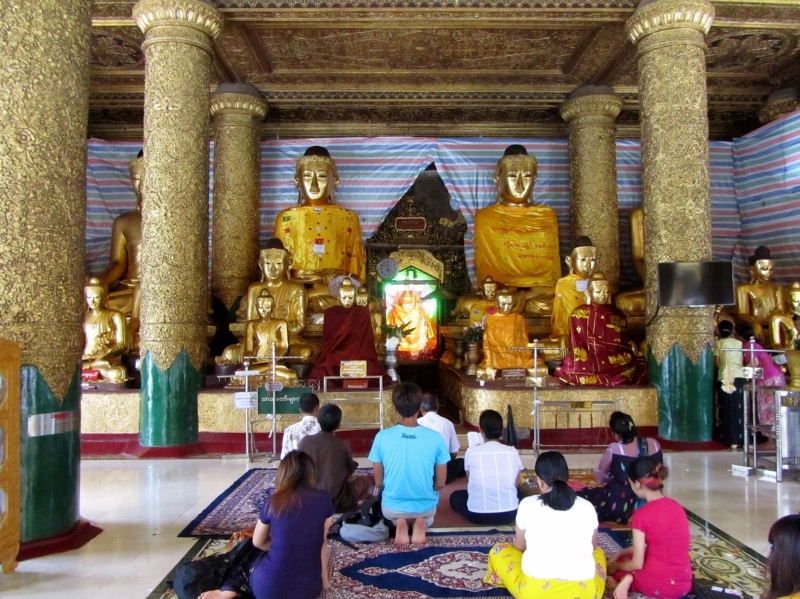 It’s been rebuilt several times and since the 15th C the stupa has been covered in gold. 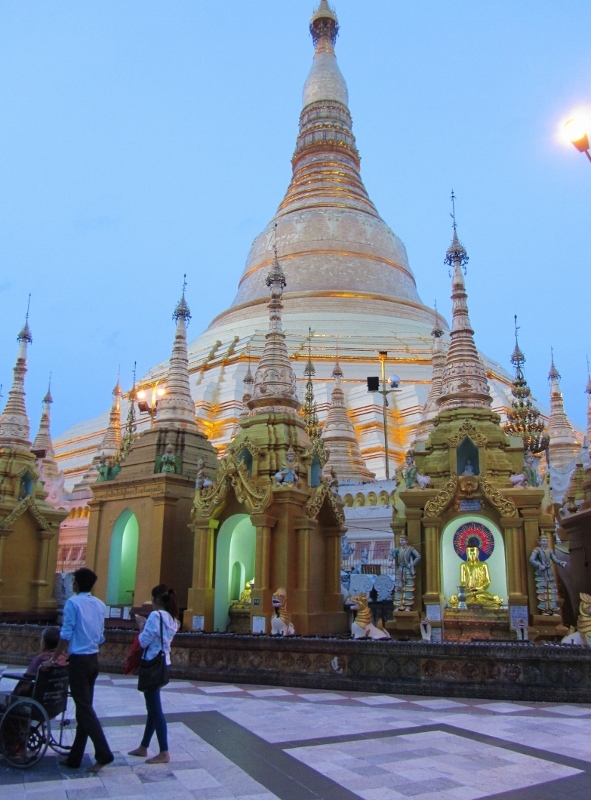 There is so much more than the stupa though, and I spent an entire afternoon and evening there exploring the many little shrines, seeing the place change from day to night, and people-watching. 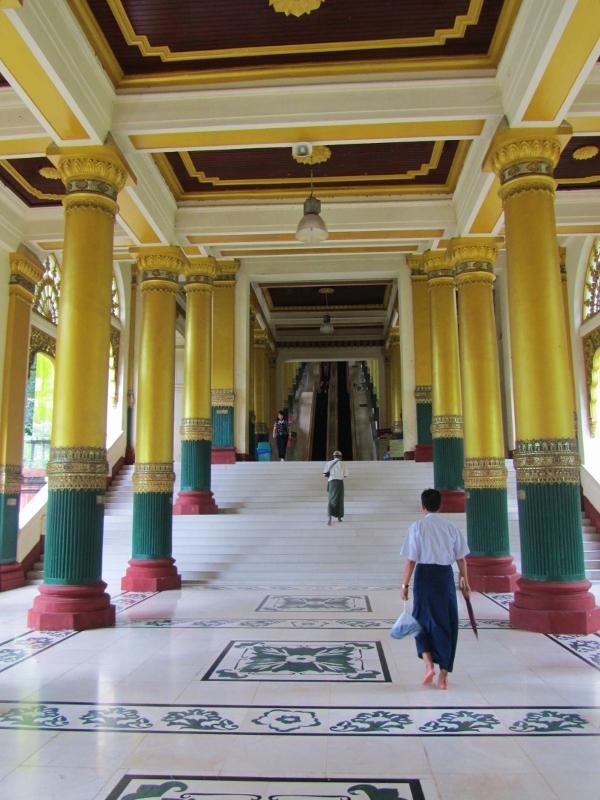 There are four entrances to the pagoda site and the western one has escalators. Foreigners have to pay an entrance fee and you are given a sticker to wear. You can leave your shoes in lockers by the ticket office. 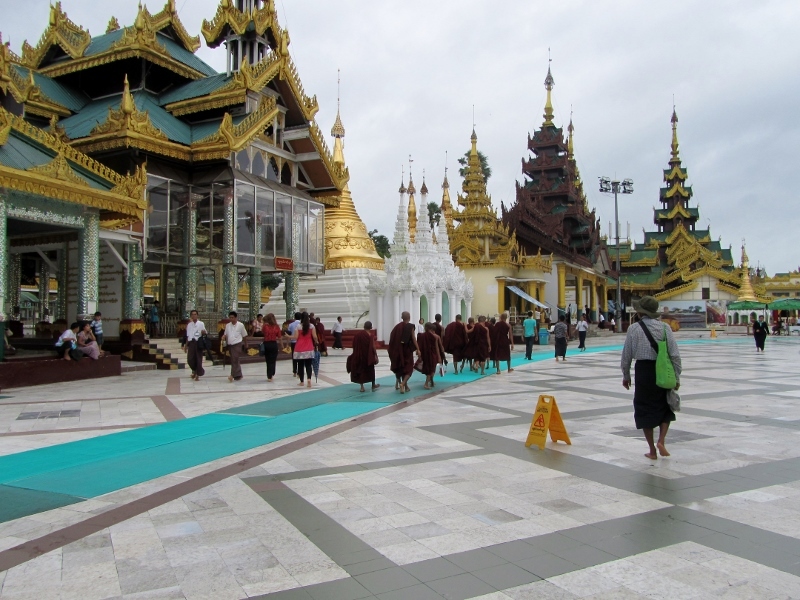 The marble floors are quite slippery in the rain so outside there are green plastic mats to stop you from slipping as you gaze up at the golden stupa. You’re supposed to walk clockwise around the stupa and there are lots of little shrines that have Buddha statues or reliquaries around. In one there was an exhibition by a Sri Lankan photographer who took pictures from the places in India that were important in the life of the Buddha. There was another little museum that had photographs of the parts of the stupa that can’t be seen from the ground. 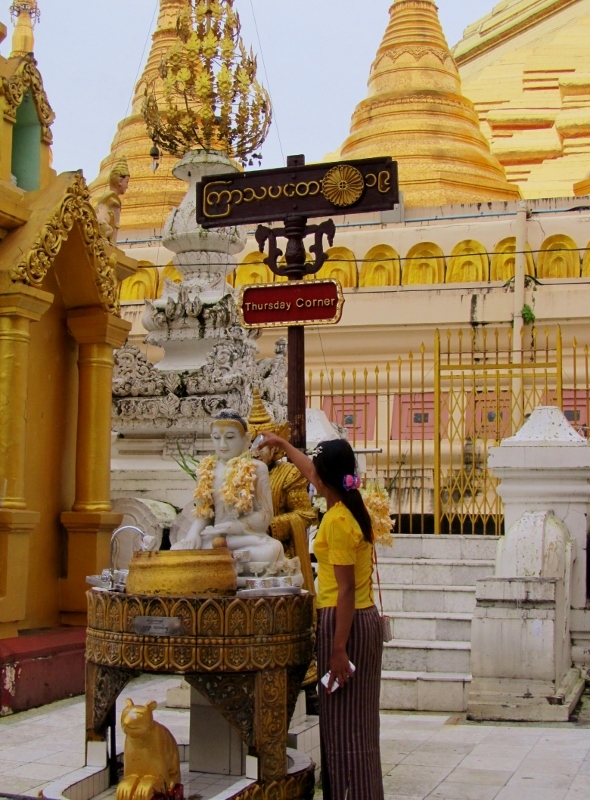 These photographs were taken when the top of the stupa was restored. 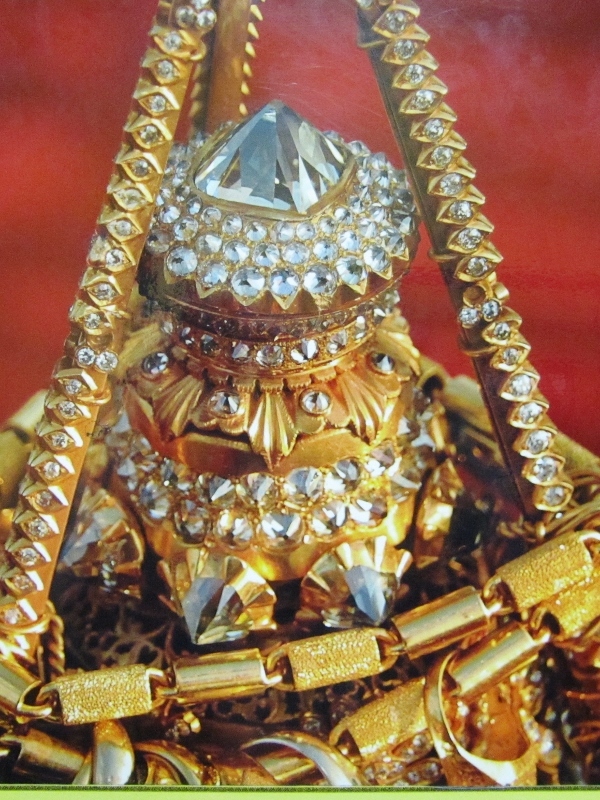 Many people donated jewellery to decorate the bud at the top, which is tipped with a 76 carat diamond. 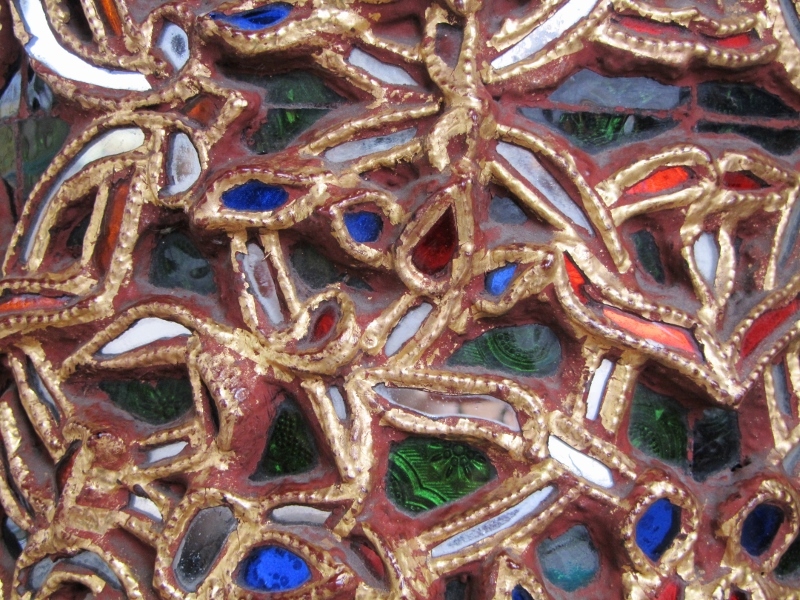 The stupa itself is not covered with gold leaf but with gold plates, which really is an incredible amount of gold. 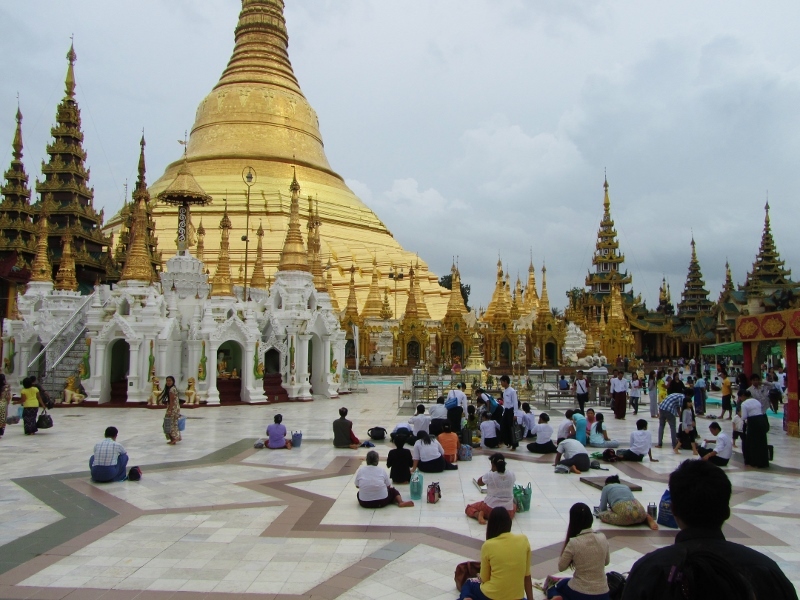 There weren’t very many foreign tourists there because of the season, so it was really great to see how important the Shwedagon pagoda is for the regular people of Myanmar. Of course, it’s also a domestic tourist attraction as well as a site of worship and pilgrimmage, but it’s also just somewhere to hang out and meet friends. Recently one of the reasons Myanmar has been in the news has been because of the plight of the Rohingya Muslim ethnic minority who either live in camps in Myanmar as they are not considered citizens, or attempt to migrate to other south-east Asian countries and get stranded in boats out at sea. As someone who doesn’t live in Myanmar, of course I couldn’t see any kind of discrimination against Muslims when I was there, but the fact that Aung San Suu Kyi’s NLD party hasn’t included any Muslim candidates for the upcoming elections as an attempt to appeal to the core Buddhist Burmese population, is telling. 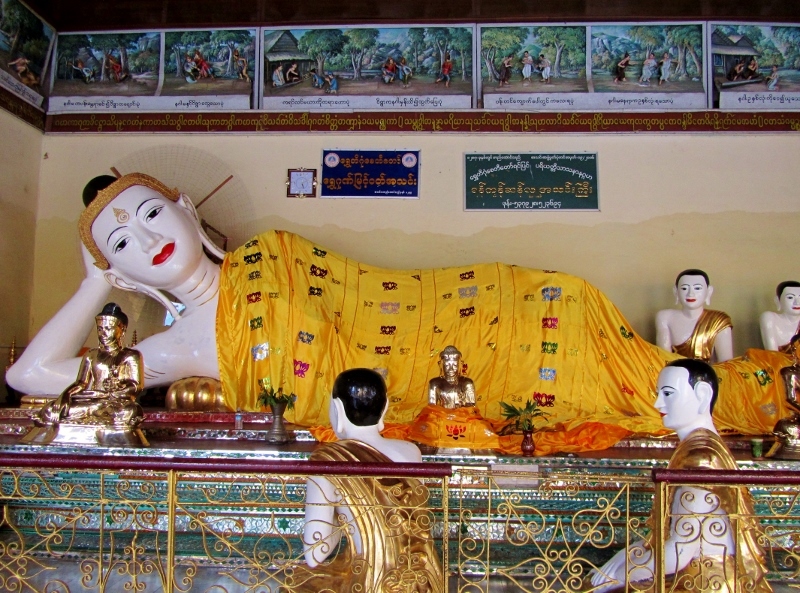 The rise of ‘militant’ Buddhism in Myanmar (as in Sri Lanka) is baffling to those of us in the West who viewed Buddhism as an intellectual philosophy, but it’s a religion just like Christianity and Islam to many countries in Asia, with all its cultural traditions and contradictions (I recommend this podcast to understand how Buddhists in Myanmar view their religion). 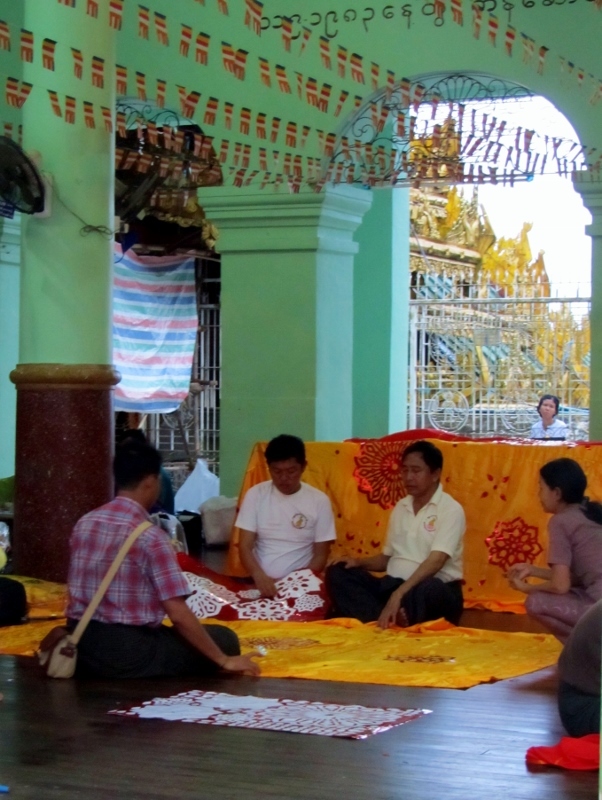 I had been recommended to get a guide to show me around and it was nice to have certain things explained to me, like the significance of the day of the week when you were born, the different relics and customs of the pagoda. My guide was really nice and we talked about education, government and Myanmar’s relationship with Japan. After he had taken me around, I was just sitting taking a rest when another guide, a man with a topknot and a book of references approached me. I don’t doubt that he would have given me a good tour, he was very chatty and animated and I’m sure he had a lot of good stories, but when I told him that I had already taken a tour, he didn’t accept my refusal. Usually if you say a simple ‘no thank you’ to salespeople in Myanmar they’ll leave you alone, but this man insisted on testing me on what I had learned with my previous guide and he was clearly trying to trip me up with his questions. When I asked him to leave me in peace, he said he felt sorry for my ignorance and stormed off. I only planned to stay for the afternoon, but once the light started to change, I stayed longer to see the stupa lit up and the moon come out.